Isn't it wonderful when you find a site that makes you feel like you've just come home? I absolutely love the feel of Gifted Imaginations. Just go to their website and you will KNOW what I mean! It's so fun and inviting. 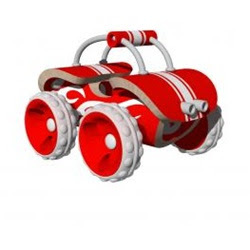 Are you looking for safe, healthy and unique toys for your child(ren)? Gifted Imaginations has a fantastic selection. It took an unbearably long time for me to choose what toy to review. Honestly, even though they have a great selection for every age, I loved their products for younger kids! 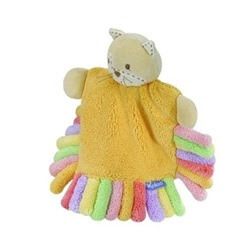 You can see that their aim is for kids to have hands on textile experiences with the toys they're playing with. Toys that require imagination! Not only do they have toys for kids, they have Green Label Organic children's clothing. 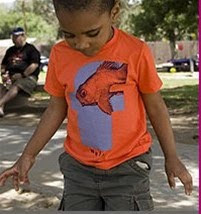 Gifted Imaginations is literally a one-stop shop for great kid gear. Looking for household items? Check out their Crocodile Creek collection of placemats, canteens, and lunch boxes among other items. Gifted Imaginations carries lines I've heard of such as Melissa & Doug, Manhattan Toys, and HABA. On the other hand, I was introduced to a whole host of other amazing lines: Deglingos, Bamboo, and P'kolino to name a few. To be fair to my boys (cause we don't want any trouble) I let Wendy select what to send us. She sent the Melissa & Doug Magnetic Responsibility Chart. I told Wendy this was going to be more for me than for the boys! I would've chosen the Hangman if my 6 yr old weren't into doing Paragraph Hangman. Do you have any idea how long it takes to solve his Hangman? 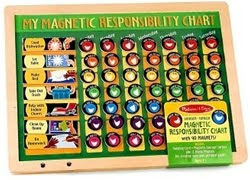 The boys were actually excited about the Responsibility Chart and immediately claimed their colors for reward magnets. We were able to tweak the Chart so that it fit us better. It comes with 2 blank white magnets. We covered up the days of the week and put the white magnets, now with their names, over them. Along the left side I lined up what they typically do on a daily basis in the order of activity. All week they have gone to it nearly every time they've completed a task and put their colored "done" magnet in their appropriate lines! As with most kids, the extra labeled magnets will come in very handy. Not only are they "chore" magnets, they have magnets that encourage good behavior! Gotta love it. My package came so fast and the communication with Wendy was fantastic! Working with them has been an utter treat!! Would you like to win a $25 gift card from Gifted Imaginations? REQUIRED: Follow Gifted Imaginations on Twitter! Must be at least 18 yrs old and a US Resident. Requirement must be done before and "extra entries". Please leave an email or have it available in your profile contact. No email/contact = No entry. Giveaway ends 3/29, 10pm CST. Void where prohibited. "Win a $25 GC from Gifted Imaginations @ Woven by Words: http://bit.ly/cjZj5f @giftedimaginations Awesome Kid Products!" *Rest assured this Responsibility Chart is being used by my boys. Unfortunately, my daughter is using my camera for school and I have no way to take pictures right now! Sorry! It's hanging on the wall between the boys rooms. I'd like to thank Wendy from Gifted Imaginations for sending me the Melissa & Doug Responsibility Chart. This is not a sponsored post and the review is soley from my own experience with Gifted Imaginations. Absolutely anything Victorian dollhouse. Never had one as a kid, and still love them!!!! I'm following Gifted Imaginations on Twitter. I'm following Gifted Imaginations Blog. Entered the Becoming Lucy Giveaway. Absolutely love your blog, Mimi! Entered the Overnight Prints giveaway. Facebook fan of Gifted Imaginations. I commented! Following gifted imaginations on twitter. I love the push along frog. I really like the chore chart, my husband & I have been talking about getting one. This looks like a good one! I am following gifted imaginations on twitter! I am a fan of Gifted Imaginations on facebook! I left a comment on gifted imaginations facebook page mentioning wbw. I'm following Marvelous Mom Reviews! I entered the giveaway for the temporal thermometer! I follow gifted imaginations on twitter! Following Gifted Imaginations on Twitter! Following Gifted Imaginations on Twitter as annaed2.